Set within landscaped grounds across 2.5 acres, Arena Ferndown provides a superb environment for modern businesses in an out of town location. Located just off the A31 the centre is within easy reach of the M27, making it conveniently situated for access to Bournemouth, Ringwood, Christchurch, Wimborne and the New Forest. 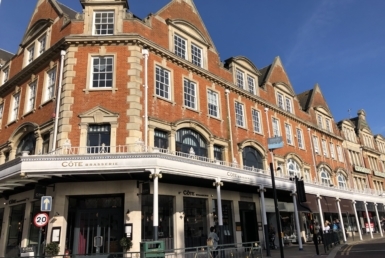 A range of offices and studios are available at the centre, providing the perfect workspaces for businesses of all sizes – from SMEs to entrepreneurs and larger corporations looking for a base in the area. The modern centre is offered collaboration spaces, communal areas, kitchen facilities and a café. On-site meeting rooms offer space for presentation, interviews or client meetings and can be booked by the hour or for longer sessions. Post room facilities are also available. A dedicated centre team is on hand to help greet visitors, arrange IT and telecoms, make meeting room bookings and deliver your post. POA exclusive of VAT, insurance, business rates and service charge where applicable. Arrangements to view through the agents J.M.Watts (01202 461586).